Pumped? You bet. The conditions were superb  mostly blue skies, crisply cool temperatures, snow that was slightly icy, but not bullet-proof slick. The first few runs off Mt. Bachelor's most popular chair, the Pine Martin Express, were a good warm up, but the lines were long, at least by Bachelor standards. The solution? Head over to the Northwest Express Quad. From the bottom of the chair the view through the forest rises 2,365 vertical feet to the unloading zone, several hundred feet above timberline. For comparison's sake, the Pine Martin chair has a rise of 1,360 vertical feet. The ride up the quick-moving quad is a visual feast. In the lower elevations, the chair passes over thick timber, where relatively narrow trails weave beneath or alongside the lift. Up higher, the forest disappears, the scattered trees are sparse and stubby, and the slope becomes steeper. Then the fun begins. On clear days the view of neighboring peaks  Broken Top and the Three Sisters (South, Middle, and North Sister peaks)  is eye boggling. 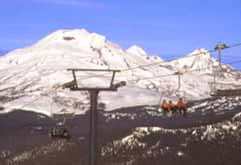 There is no easy drop off the Northwest lifts top slopes, although a cat track meanders down along the Northwest Crossover to the Pine Martin Lodge. The runs below the Northwest chair are terminator-like steep with a choice of four dip-and-dive routes  Sparks Lake Run, Osprey Way, Devil's Backbone and Snapshot Alley. Snapshot Alley bolts down wide-open slopes on a wander-where-you-will route before forking off to Atkenson's Zoom, appropriately named for Oregon's photographer emeritus, Ray Atkenson. Sparks Lake drops down a steep entrance to a narrow trail that eventually angles to an intersection with Osprey Way. Devil's Backbone is the most challenging route, one that's generally left ungroomed as it angles along a sharp ridge. My favored route  shared by others skiers, based on their comments  weaves through a combination of runs. It begins at Osprey through the snow-cloaked trees, then angles off near the tree line to Sparks Lake. A short swoop later, the rollicking fun focuses on Brooke's Run. It's not wise to simply let the skis run, especially on Brooke's, because the route sometimes sharply curls around corners and other times  surprise  splits in two around islands of trees. An adrenaline rush? You bet. That's the intent. 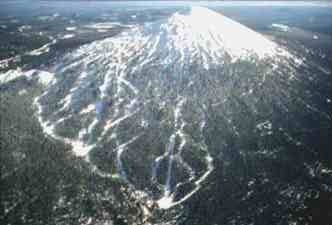 In Oregon, the ski hill 22 miles outside of Bend is regarded skiing's most eligible Bachelor. It has plenty of suitors  thousands of skiers and snowboarders from up and down the West Coast and, increasingly, around the nation. 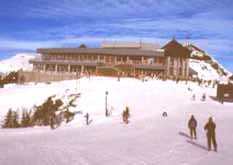 Part of its allure is a ski season that typically extends from mid-November through early July. 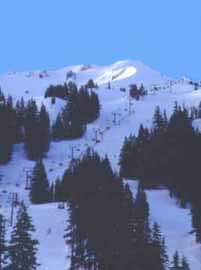 During the 1998-1999 season, Bachelor received a record 573 inches of snow and offered 233 consecutive days of snow riding. Over the past five years Bachelor has collected more than 400 inches of snow each season, which translates to an excellent snow cover on the 70 runs spread over the mountains 3,863 acres. Best of all, Bachelor features a lift system that was ranked No. 1 by Ski Industry News in 1999. With seven express quads, plus three triple chairs, two surface lifts and a double chair, it's unusual to wait more than a few minutes on even the busiest days. The express quads literally race up the mountain. It's impossible to ski an entire day without taking a break because there's so little time lost waiting in lines or riding slow chairs. When it's time for a break, restaurants and cafes offer a range of choices, from bowls of chili and hamburgers to more sumptuous treats. On the mountain itself, the Pine Marten Lodge offers a range of choices, from a cafe with the traditional fare to the Skiers Palate Restaurant, which features a selection of Northwest cuisine. New this season is Scapolo's, which fittingly translates to "bachelors" in Italian. Two base lodges also offer a choice of food and beverages. Lodges at West Village and Sunrise each include restaurants, full service bars and espresso bars. Ski lifts from West Village and Sunrise serve runs for all levels of skiers, from first-timers to experts wanting to test double black diamond runs from Bachelor's 9,065-foot summit. From the top it's possible to follow a 2-mile long route down a vertical drop of 3,365 feet. Overall, Bachelor rates 15 percent of its terrain for novices, 25 percent for intermediates, 35 percent for advanced-intermediates and 25 percent for experts. rides offer a break from skiing Bachelor isn't just for skiers. Snowboarding is allowed on all runs with two areas for boarders wanting to sharpen their skills. The half-pipe includes sculpted 8-foot wide walls while the Terrain Park has table tops, quarter pipes and wall hits. 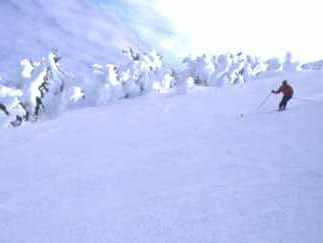 Bachelor is also a world-class cross-country ski facility that has made Central Oregon the home for some of the nation's best Nordic skiers. A lodge near West Village houses a cross-country ski shop and restaurant that accesses 56 kilometers of machine-groomed trails and connects with miles of signed Forest Services routes. It's also possible to learn about the mountain through free Deschutes National Forest tours, include geological tours on skis, a snowshoe nature walk, and cross-country ski tours. 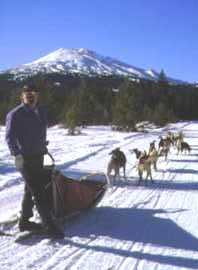 Oregon Trails of Dream Sled Dog Rides offers 10-minute tours for children, plus standard hour-long rides and 26-mile half-day excursions. No mountainside overnight accommodations are available, but a variety of lodges, inns, motels and hotels are located in and near Bend. 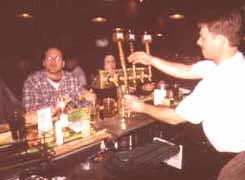 In 1999, Mountain Sports & Living magazine ranked Bend No. 5 among the nation's Top 10 mountain towns, partly because of its proximity to Bachelor and the city's many restaurants, golf courses, art galleries, micro-breweries, and visitor sites like the High Desert Museum. Oregon's most eligible Bachelor finds many ways to excite.